I’m really excited for this recipe swap with Sheleana and her partner Caleb from Young and Raw! Their site is chalk full of great smoothie recipes as well as raw food dishes and treats. As someone who loves green smoothies, their Iron-Rich Energy Greens Smoothie was right up my alley. I made a slight modification to the original recipe by using a bit more spirulina since I didn’t have chlorella on hand. The original recipe serves two. I cut the ingredient portions in half for one serving, which is what’s listed below. Is there any better way to start your day than with a delicious green smoothie for breakfast? I think not. Spirulina may be a new smoothie ingredient for some. Spirulina is a single-celled, blue-green spiral algae that gets its green color from chlorophyll. Best known as a protein queen, it’s around 65-70% pure protein by dry weight. Spirulina is available in tablets and flakes, but the green powder is ideal for smoothies. Spirulina is rich in vitamins A (beta-carotene), B1, B2, B6, E, and K. Besides being a supreme source of protein, spirulina is also good for balancing brain chemistry, building the blood, boosting the immune system, and is a potent antioxidant. It’s been my experience that easing into spirulina is a good idea because of its potency and unique taste. If you don’t have any spirulina, feel free to substitute with an available ingredient or simply make the smoothie minus spirulina. 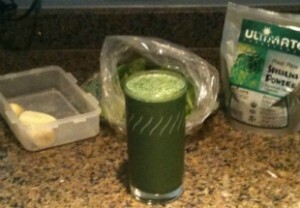 Now for the Iron-Rich Energy Greens Smoothie recipe. Put the lovely ingredients into your high speed blender and blend for 30-45 seconds or until the desired consistency is reached. While I love the idea of this iron rich smoothie, it really tastes awful. I used half the spirulina it called for as recommended since I’ve never had it before and it still tasted exactly like it. I’m not giving up on incorporating it into my green smoothie, but it won’t be for this recipe, ick. Hi Andrea, I’m sorry you didn’t find this smoothie very appetizing. Spirulina is an acquired taste and it may take you a little time to get used to it. I like Healthforce Nutritionals spirulina and think it tastes better than most other brands. Spirulina does go well with chocolate; so maybe you’ll have better luck there. I added 1 large tablespoon of Raw Honey to this recipe and had great results. I often use spirulina in my smoothies but found the taste a bit stronger than I would enjoy. Put it back in the blender with some honey and downed it. Thanks for the recipes. I like how improvised and added the honey, Edward. Spirulina can be a bit strong.